In this second plane of development we believe that children should still have the freedom to move while learning and also enjoy their social character during the work cycle. Children may choose to sit on the floor or at a table while working, with a friend if they are doing so responsibly, or independently. As we believe in fostering self-discipline, the idea is to let the children enjoy learning instead of working towards rewards or with the threat of punishment. Work is therefore made interesting and shown to be purposeful to children. Because they can work with friends, energy is not wasted in trying to sit still or be quiet, but utilised to work efficiently. 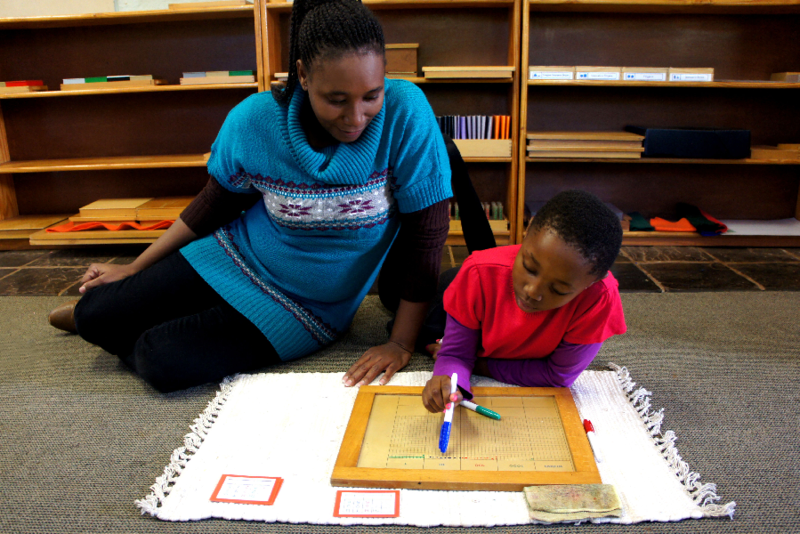 As we believe self-discipline is the only true discipline, children are given opportunities to make choices regarding their education and daily activities, while given strong boundaries according to what is expected by the community as a whole. The day’s work is given to children in the morning and they choose when during the three hour work cycle it gets done. Repetition of academic concepts is done through various didactic materials which incorporates the hand and the senses, giving the child a concrete experience of abstract concepts to aid understanding and exploration, rather than rote learning. Children work mostly in groups according to their abilities, but are also given the choice to work with friends of different age groups. This mixed age grouping of the children helps the older learners to develop role model and leadership skills and motivate the younger children to strive for the same excellence as their peers and role models. Montessori also believed that the children of this plane are developing moral independence, so a lot of focus is spent on helping the children explore different cultures and traditions, therefore exposing them to the world and its wonderful diversity. They are also motivated to work out differences and conflict themselves, learning to handle each other with respect and reverence while peacefully managing interaction. The outdoor environment is just as important for this age group and we utilise our wonderfully big area to our best advantage. Children can chose to work outside and some presentations or lessons are also done using the natural resources that are available to us.